How much does South Carolina Really Matter? All Things Considered Looks Ahead. 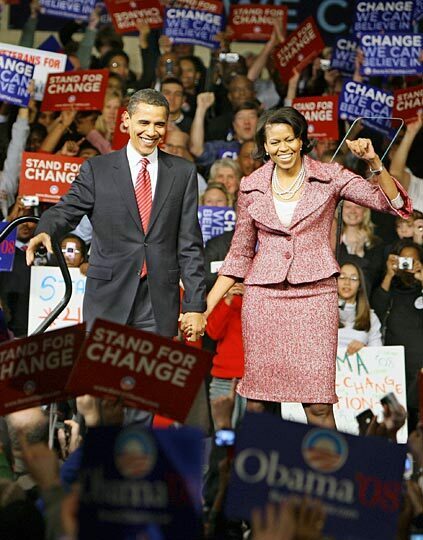 Obama and his wife Michelle celebrate victory in Saturday's South Carolina primary. Democrats in South Carolina turned out in unprecedented numbers for their primary Saturday and handed Sen. Barack Obama a 2-to-1 victory over Sen. Hillary Clinton. Obama secured his first win since the Iowa caucuses by claiming 80 percent of the African-American votes. The turnout of more than half a million eclipsed the Republican turnout from a week ago by 100,000 votes. Six months ago, Clinton was not only leading the polls in South Carolina, she was edging out Senator Barack Obama among African Americans. But in the end, Obama got four black votes out of five and they propelled him to an outright majority of the overall vote: 55 percent to Clinton's 27 percent and Edwards' 18 percent. Obama's big margin held among African-American women as well as men — including women such as Shirley Spears of Union, S.C., who says she thought the Illinois senator had a unifying message. She says that she noticed white volunteers working for the Obama campaign — both during door-to-door canvassing and on the phone. "I think it was a black and white thing .... they worked together with this," Spears said. About two hours after the polls closed, Obama stood before a crowd that periodically burst into chants of "race doesn't matter." He told his supporters they were challenging the assumptions of identity politics. "The assumption that Republicans won't cross over. The assumption that the wealthy care nothing for the poor, and that the poor don't vote. The assumption that African Americans can't support the white candidate; whites can't support the African-American candidate; blacks and Latinos cannot come together. ...We are here tonight to say that this is not the America we believe in," Obama told the crowd. Obama referred several times to his win in Iowa and strong showing in New Hampshire — states with few minorities — repeatedly insisting this primary was not about race. "This election is about the past versus the future. It's about whether we settle for the same divisions and distractions and drama that [pass] for politics today, or whether we reach for a politics of common sense and innovation — a politics of shared sacrifice and shared prosperity," Obama said. The blowout result capped a long week of fierce exchanges between the Obama and Clinton camps. Obama complained of the tone and tactics not only of Hillary Clinton, but of her husband, former President Bill Clinton. In turn, Clinton has said the Obama campaign has attacked both him and his wife personally. By Friday, both campaigns tried to tone things down by pulling negative radio ads off the air, but in that time Obama saw his support among white voters diminish. In Saturday's primary, he received just 25 percent of the white vote — the rest of which went about equally to Clinton and former North Carolina Sen. John Edwards. Saturday night, Edwards vowed to push on — despite finishing third in the state where he was born and the only state he won in his 2004 bid for the presidential nomination. "If you're one of the millions of Americans who have yet to cast your vote in this democratic process, beginning on Feb. 5 and moving beyond, your voice will be heard, and we will be there with you every single step of the way," Edwards told supporters. By the time Edwards was talking about moving on, Sen. Hillary Clinton already had. The lights weren't out at local polling stations before she was on a plane to a Super Tuesday state. Speaking at a town meeting-style event in Nashville, Tenn., she congratulated her rival, but made it clear this was little more than an evening of the score at two big wins each. "I've always said that this contest was going to go for a long time. As people have dropped out, it's gotten down to a couple of us. And Feb. 5 has always been for me the key," Clinton said at the campaign event. This was the last Democratic contest before Super Tuesday on Feb. 5. Florida votes on Tuesday, but the result will not yield any delegates on the Democratic side. The Democratic National Committee has stripped the state of its delegates for moving its primary into January in violation of party rules — and the candidates have not campaigned there.